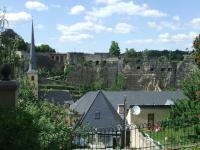 The City of Luxembourg: its Old Quarters and Fortifications is one of Europe's greatest fortified sites. 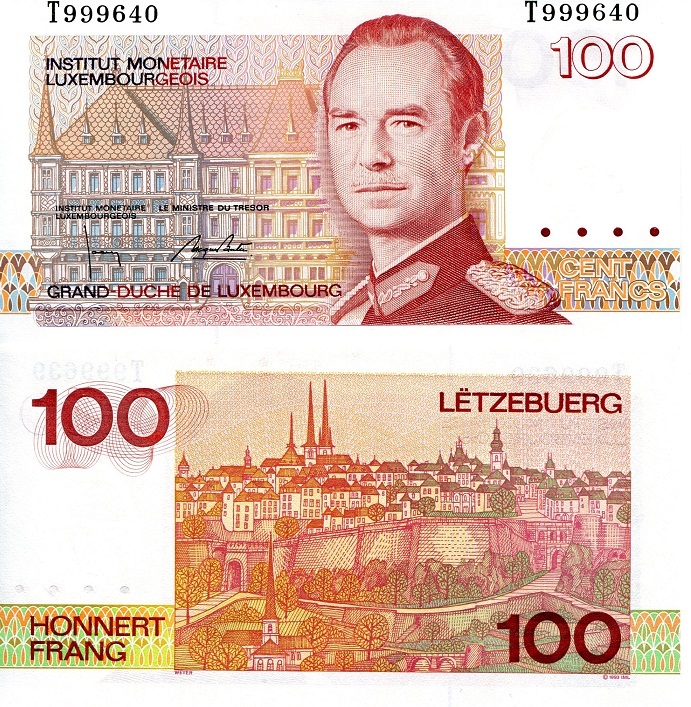 Luxembourg - not a city yet - already made its appearance in history in 963. In that year, Count Siegfried came in possession of the strategic rock. He built a castle there, which could be defended easily because of the Alzette Valley that surrounded it for the largest part. The successors of Siegfried did not succeed in keeping hold of the rock, though they built large walls to defend themselves. Until the 19th century several European powers overtook control. Among them were the Burgundians, the Spanish, the French, the Austrians and the Germans. Every single group fortified the place even more, until it was known as the Gibraltar of the North. Underground a phenomenal network of casemates, 23 kilometers in total, was constructed. This was meant as a hiding place for the soldiers in times of war. Large parts are still intact, and can be visited. Luxembourg is such a lovely city. I had been there before (in 1984), but it did take me with surprise. The old city is very well preserved. It takes you back in time to the European Middle Ages (though most of the remains date from the 16th - 19th century). Probably the best thing to do there is to take the Wenzel-walking tour. The route is well-signposted around the city, and takes you up and down - and beneath - the old fortifications. The walk takes about two hours and gives you a lot of photo-opportunities: the panoramas are sublime. Although Luxembourg is considered to be a somewhat dull city in Belgium, we visited the city center (Oberstadt) a couple of years ago and found it quite nice. So a few weeks ago we drove to Luxembourg again, this time to do the Wenzel walk. This approx. 5km circular walk mainly leads you through the Grund quarter, along the city's fortifications / old city walls and also includes a number of good viewpoints. With some time left, we also visited the Grand-Ducal's palace which is possible by guided tour in the summer months (but no pictures allowed inside). 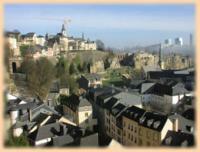 Luxembourg is not a big city but certainly worth a one or two day visit. My best friend lived in Luxembourg for a year and a half, and I went over to visit him on three occasions: in October 2013, April 2014 & November 2014. There is a municipal lift that takes you from the upper levels to the lower levels. This is necessary because of the rocky promontories on which the city was built. We found it rather hard to track down, but got there in the end. The grandest building in Luxembourg is the Notre-Dame Cathedral, which is just impossible to photograph in its entirety because of the number of large buildings that have since sprung up around it. On my second visit we went to Fort Thüngen, which is pretty much a reconstruction. The original fort was destroyed after the 1867 Treaty of London, which required Luxembourg’s fortifications to be torn down. Across the valley you can see the Bock casements. These were tunnels built into the cliff by the Austrians, with openings every so often for cannon emplacements. On my final trip we had a good old fashioned WHS drinking session on the cobbled streets of Luxembourg’s Grund area. A highlight of the city is the Luxembourg National Museum of History and Art. The next morning we took a train out into the countryside with the intent being to visit Vianden Castle (on the Luxembourg T-list), close to the German border. I visited this WHS in June 2010. The highlight of my trip was the meandering river close to the fortifications of the city. I visited several other times but it is quite rare to enjoy a warm sunny day here! 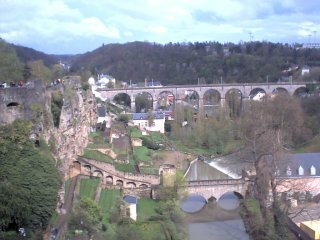 March 2003: I visited Luxembourg by train from Brussels and spent two days wandering the city. One of the main things you will notice about LUX is how exceptionally clean and tidy it is and every morning (at around dawn) street sweepers will be out in full-force. 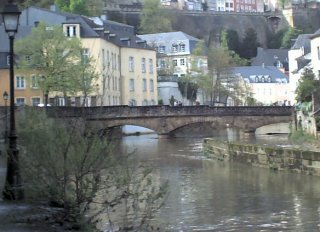 The city itself is rather bland, as far as entertainment goes, but it's worth at least a day to walk around the different city sections (which is easily manageable on foot) and which are separated by a short, but prominent bridge (below the bridge is an area called "The Grund" which houses the majority of the nightlife). I left the country by train again to Munich. I made it there in September 2009. I had decided to make Luxembourg the last stop on my trip. The stop before this was Trier. And I will always remember what I saw just after the train left Luxembourg station. What I saw was like something from a fairy tale. It was all misty looking (it was in fact raining) and then there were all these gorgeous historical buildings all around the valley. My favourite spot was at this lookout point from which I got a fantastic view of the Grund and the buildings along the Chemin de la Corniche. I found this city simply beautiful. This has to be one of the most congested cities in Europe, and finding parking is a nightmare. On my first visit the only parking we could find was at the Hamm military cemetery several km from the centre. So last year I went by train and found the Wenzel Circular Walk which made seeing the city on foot so much easier. Another advantage of travelling by train was the cheaper hotels were across from the station in rue Strasbourg. I used Luxembourg as a base for visiting Trier, Volklingen, Nancy and Longwy. The view from the old city wall is beautiful and you can easily spent some time hanging around there. When you get up early and go to the city wall the city looks beautiful in the foggy morning light. Visit the Casemates (the fortified wall) where you can actually walk inside the wall since it used to be a castle. Downtown, the Place d'Armes and the Place Guillaume are interesting and a place where lots of people gather. The city is beautiful, with nice little streets and squares, beautiful buildings and parks. It really shows the people have a lot of money, you hardly see any small cars and I didn't see any homeless people at all. 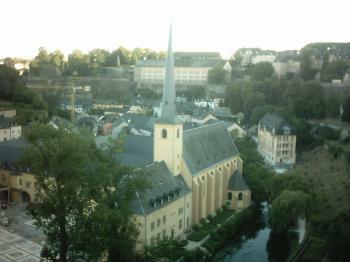 I only saw Luxembourg on a daytrip from Brussels, but it was a very nice experience. 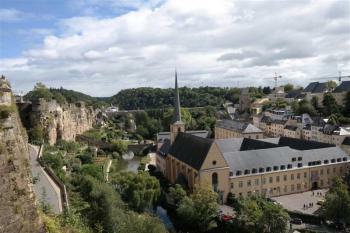 On the one hand, Luxembourg is a European capital with lots of banks and office buildings in a multi-cultural and multi-lingual environment, on the other hand its old town is very well preserved and interesting, especially the cathedral and all the fortifications. 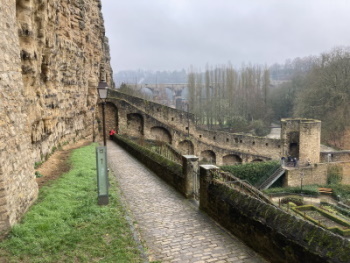 Luxembourg was once the most heavily fortified place in Europe, and it shows. Not all remains, but what you can still see gives you a great impression of military architecture, of forts and castles, ramparts, walls, cannon, etc. A worthwhile trip not only for history buffs. Luxembourg is a real treat. I was not expecting much of it but it turned out to be one of my favourite European capitals so good I decided to go back! The setting is almost perfect with the historic centre surrounded by a valley which has some nice bridges and parks at the bottom all of which are lit up spectacularly at night. It is also one of the cleanest places I have ever been to and whilst the centre is not stocked with monumental buildings there are lots of nice little places (the smallest parliament building I have ever come across) and the square in centre seems to have lots going on there! I have seen two classical concerts and a Brazilian dance troupe and I have only spent two nights here! I have still to see the tunnels and casemates properly which are one of the main reasons for its inclusion on the list as the tours have seemed to be sporadic whilst I have been there. If you want to add another UNESCO site and country then it is about 30 minutes by train to Trier in Germany, a lovely ride through the vineyard lined Mossel Valley resulting in some very good wines especially the dry Rieslings! The one problem is that there is very little budget accommodation, one hostel and the hotels are catering for business travellers mostly so you will have to book in advance or go for a bit of a trip up country! 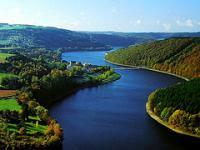 But even so Luxembourg is one of my favourite UNESCO sites. The campsite a few miles south of Luxembourg City was very pleasing, with indoor tennis courts, and good facilities for showers. But perhaps that depends on which shower is used. Jim had no problem, while Emmy had all kinds of problems. Water too hot in one place, not hot enough in another, got her clothes wet in the third, you name it. Jim said the fellows would help her with her shower, if she just came to our side. Soon after the Battle of the Bulge, Jim’s Brother Paul drove his US Army truck into Luxembourg on the day it was liberated, with a member of the ruling family inside. Jim suggested Paul contact the family. Paul said, “No thanks,” he didn’t care to revisit anywhere near the Battle of the Bulge. Built in the 17th century: Much of the remaining main components were (re)built during the 17th century: the casemates, Grand Ducal Palace (1683), Cathedral of Notre-Dame de Luxembourg (1621), Vauban designed military barracks (1684). The fortifications date from medieval times (12th-15th century). Country named after them: The castle at the heart of the country was originally called "Lucilinburhuc" (possibly meaning "small fortress") when acquired by Siegfried Count of Ardennes in 963. This castle grew into a town and became the centre of the small state named after it. Built or owned by French: Sun King Louis XIV besieged the city and annexed the duchy (Vauban then augmented the fortifications of the city of Luxembourg). After being regained by the Austrians, France annexed Luxembourg again under the 1st Republic and until the downfall of Napoleon. 475 Community Members have visited.